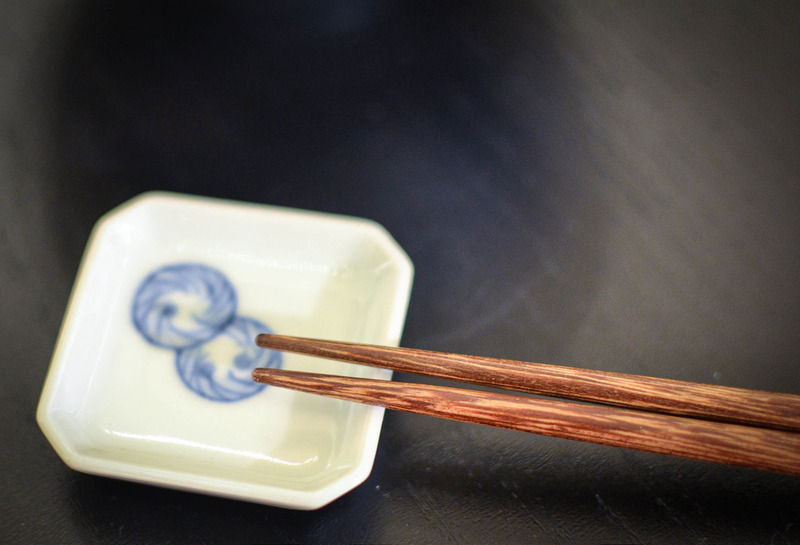 Washoku – 和食 – is the name for traditional Japanese cuisine and has been added to UNESCO’s cultural heritage list. The Japanese are of course incredibly proud of this and earlier this year the Japanese Ambassador to the UK, Mr Keiichi Hayashi, declared 2014 to be the ‘Year of Washoku’. 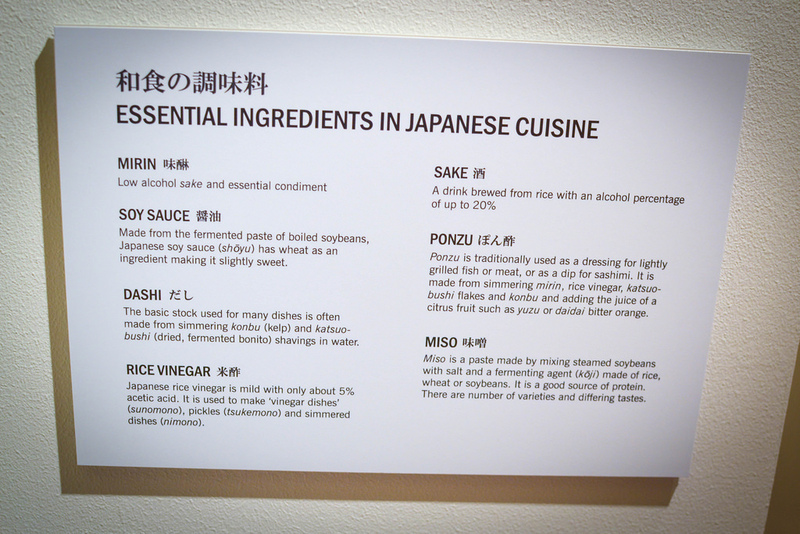 There is an exhibition at the Japanese Embassy in London which sets out to explain the various aspects involved in preparing and eating Japanese food. 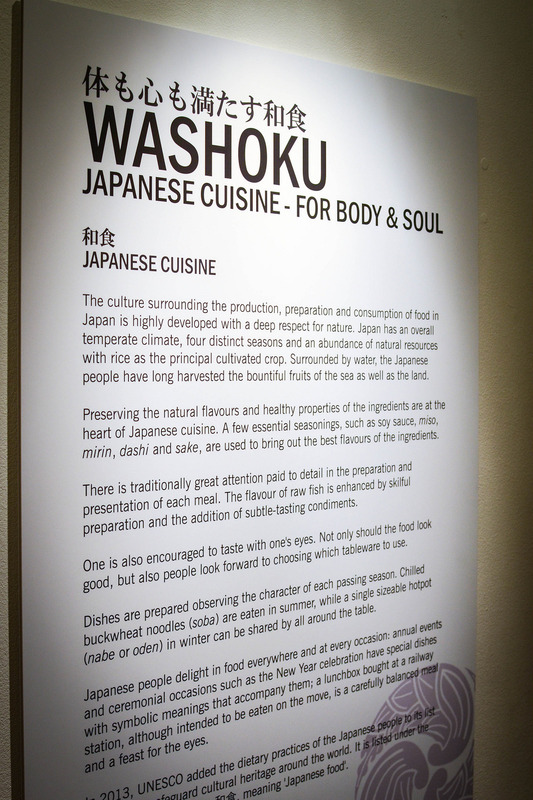 It’s called Washoku – Japanese Cuisine For Body and Soul. I was invited to a preview of the exhibition. 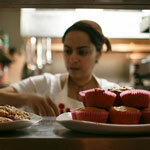 First to speak was chef and tutor at Sozai Cookery School, Akemi Yokoyama. She went through the key ingredients of Japanese cuisine. 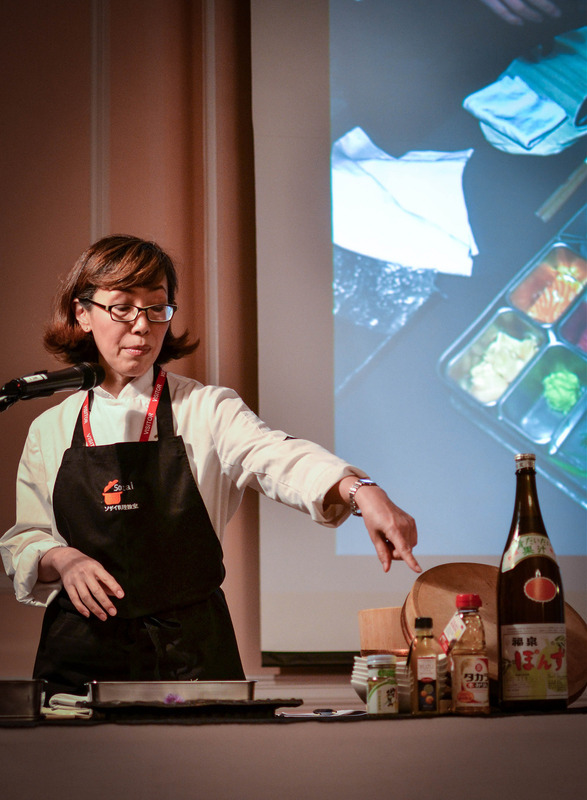 She also demonstrated Temarizushi – a very easy dinner party sushi dish. Although all the flavour combinations sounded lovely, the one that stuck in my mind and on my tastebuds was the Seabass with Yuzu Jelly. I’m a huge fan of yuzu and was really pleased to discover Yuzu Kosho at this event. It’s a fermented paste made with chilli, yuzu peel and salt and I am going to have a lot of fun with it this summer experimenting with it in salads, dressings and canapés. The way food is eaten and the way it is served is very important in Japan. Having lived there for three years I can tell you that I never once had a dish that wasn’t immaculately presented – even street food is pretty. Meals are often served in lots of small bowls and on plates with different designs and scenes from Japanese life. 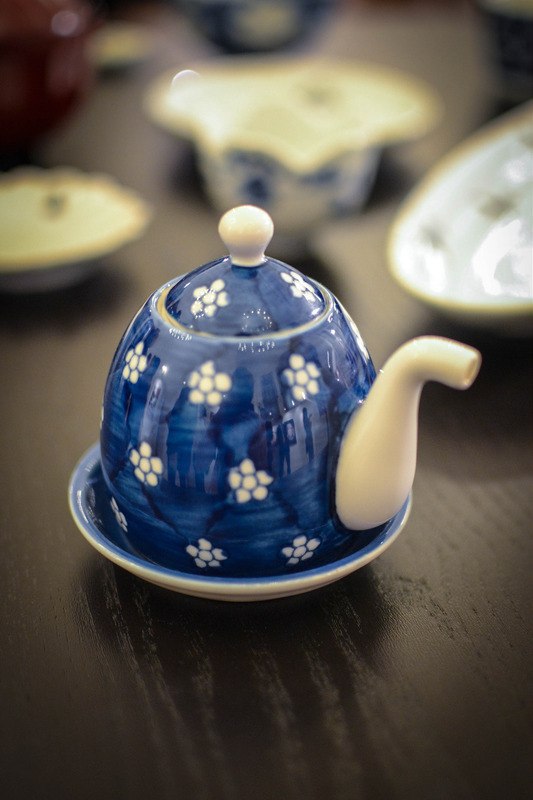 In this exhibition there is a special display of porcelain from Arita. Suzuta Yukio, Director of the Kyushu Ceramic Museum talked us through this Aritamaki which he sees as ‘food for the eyes’. He showed us how the imagery illustrated on the porcelain since the 16th century has taught us how people used to eat and what condiments would have been in their store cupboards. He explained how a meal will be created so that the food and the tableware complement each other and how the pottery would ensure there was plenty to talk about after the meal. The exhibition is on at the Japanese Embassy in London at 101-104 Piccadilly. It runs until the end of June and is free of charge though you’ll need some photo ID to enter the building. Thank you to the embassy for inviting me to view the exhibition. 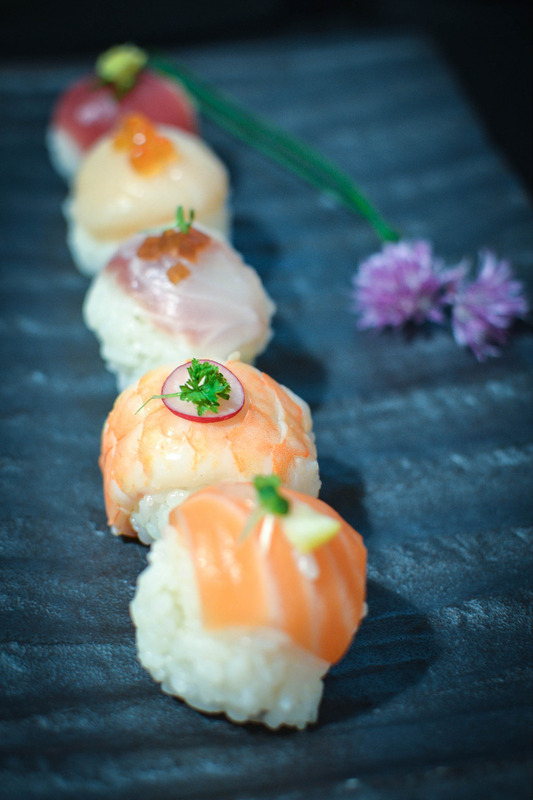 I love your photos here and they represent how delicate and exquisite Japanese food really is. I must try to get to the exhibition in June. Thanks Laura. It is exactly that delicate and pretty. Even my favourite takoyaki stalls outside Kichijoji Koen had edible flowers as garnishes! Really interested to read this. I know very little about Japanese food and cooking… wonder if I can find an excuse for a trip to London soon? Yes do! Would love to meet up if you do. There is also Koya to visit as part of a Japanese adventure! It was very nostalgic for me attending this event. I lived over there for three years and was surprised to understand almost all of the pottery talk. I love the customs and ceremony around every day food over there but there are ‘ethical’ downsides too – they cling film everything! Even fruit in the supermarket is not ‘sniffable’ as it’s wrapped up individually. There must also be much wastage as you will never see an odd shaped vegetable. In the whole time I was there I only found a couple of markets where produce was sold. But having said all that I lived in Tokyo so I know the provinces are very different. I also love the preservation techniques the Japanese use. Drying vegetables I’d never even heard of. Can’t wait to take my girls there. I’d love to try some more authentic Japanese food… much as I enjoy conveyor belt sushi I’m conscious it’s not very authentic! Indeed. The temarizushi was fantastic. Sushi rice with rice wine vinegar. Configured into balls and then fish on top. Your son would love it! What a beautifully photographed post Urvashi 🙂 I’m off on a Japanese Cookery Course in June with one of my friends as it’s a cuisine I don’t know enough about. I’m really excited to learn more! Awesome. Where are you doing the course? I must read up on my recipes. Had many women pass me some family favourites. There also is a good book called Japanese Women Don’t Get Old or Fat which is a funny tale with recipes.